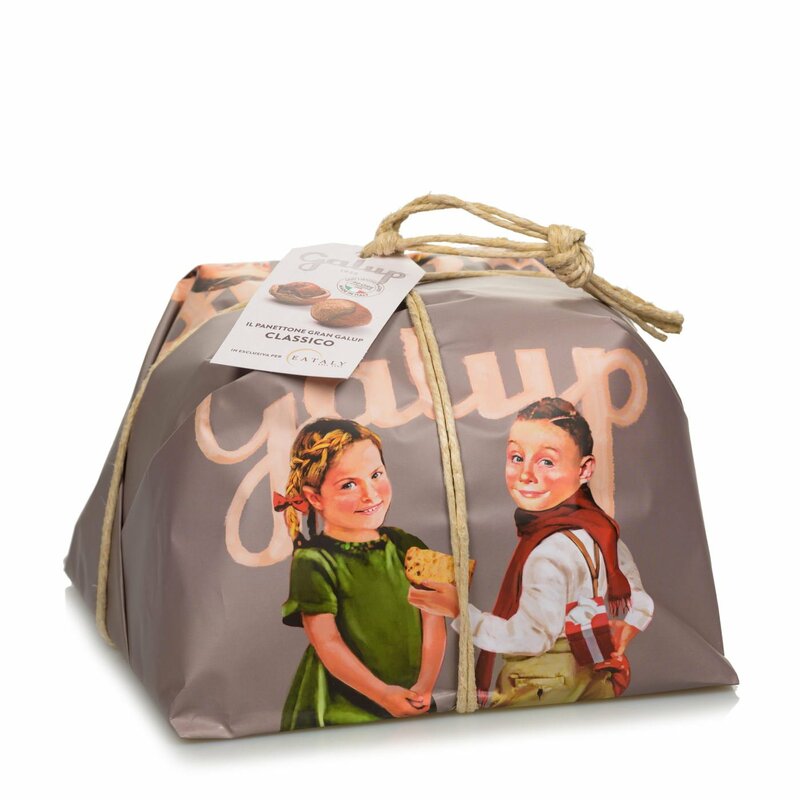 The Gran Galup panettone has all the flavour and goodness of a home-made cake. It's made to the original recipe using fresh candied fruit and choice sultanas, and then decorated by hand. You'll be enchanted as soon as you open the package by its lovely aroma and coat of crunchy icing. Treat yourself or someone else to a Gran Galup panettone, a traditional cake that's an essential part of the festive season. Ingredients Classic Panettone: type “0” Wheat flour, sultana grape, butter, sugar, candied orange zest (orange zest, glucose syrup/fructose sucrose, acidity regulator: citric acid), fresh A category free-range egg yolks, natural yeast (type “0” Wheat flour, water), candied citron zest (citron zest, glucose syrup/fructose, sucrose, concentrated lemon juice), fresh whole milk, emulsifiers: saturated fats mono- and diglycerides, flavourings, cocoa butter, salt, malted barley extract, honey, flavourings. May contain traces of nuts. For more information on product labels, please contact our Customer Service department. The information on the labels of the products may vary for reasons beyond our control, therefore, there may be discrepancies between the information on the site and that on the products delivered. Please always check the information on the product before consumption or use. Based in Pinero, Galup has been in the baking trade since 1922, upholding such values as tradition, great flavours and a love of quality. The company has expanded over time, dedicating itself to promoting Italian excellence.